Complexity of in vivo systems makes it difficult to distinguish between the activation and inhibition of Notch receptor by trans- and cis-ligands, respectively. Here, we present a protocol based on in vitro cell-aggregation assays for qualitative and semi-quantitative evaluation of the binding of Drosophila Notch to trans-ligands vs cis-ligands. Pandey, A., Jafar-Nejad, H. Cell Aggregation Assays to Evaluate the Binding of the Drosophila Notch with Trans-Ligands and its Inhibition by Cis-Ligands. J. Vis. Exp. (131), e56919, doi:10.3791/56919 (2018). Notch signaling is an evolutionarily conserved cell-cell communication system used broadly in animal development and adult maintenance. Interaction of the Notch receptor with ligands from neighboring cells induces activation of the signaling pathway (trans-activation), while interaction with ligands from the same cell inhibits signaling (cis-inhibition). Proper balance between trans-activation and cis-inhibition helps establish optimal levels of Notch signaling in some contexts during animal development. Because of the overlapping expression domains of Notch and its ligands in many cell types and the existence of feedback mechanisms, studying the effects of a given post-translational modification on trans- versus cis-interactions of Notch and its ligands in vivo is difficult. Here, we describe a protocol for using Drosophila S2 cells in cell-aggregation assays to assess the effects of knocking down a Notch pathway modifier on the binding of Notch to each ligand in trans and in cis. S2 cells stably or transiently transfected with a Notch-expressing vector are mixed with cells expressing each Notch ligand (S2-Delta or S2-Serrate). Trans-binding between the receptor and ligands results in the formation of heterotypic cell aggregates and is measured in terms of the number of aggregates per mL composed of >6 cells. To examine the inhibitory effect of cis-ligands, S2 cells co-expressing Notch and each ligand are mixed with S2-Delta or S2-Serrate cells and the number of aggregates is quantified as described above. The relative decrease in the number of aggregates due to the presence of cis-ligands provides a measure of cis-ligand-mediated inhibition of trans-binding. These straightforward assays can provide semi-quantitative data on the effects of genetic or pharmacological manipulations on the binding of Notch to its ligands, and can help deciphering the molecular mechanisms underlying the in vivo effects of such manipulations on Notch signaling. Canonical Notch signaling is a short-range cell to cell communication mechanism that requires physical contact of neighboring cells to facilitate the interaction between Notch receptors and their ligands1. Interaction of Notch receptor (present on the surface of signal-receiving cells) with ligands (present on the surface of signal-sending cells) initiates Notch signaling and is known as trans-activation2. On the other hand, interaction between Notch and its ligands in the same cell leads to the inhibition of Notch pathway and is known as cis-inhibition3. The balance between trans- and cis-interactions is required to ensure optimum ligand-dependent Notch signaling4. Drosophila has one Notch receptor and two ligands (Delta and Serrate) as opposed to mammals, which have four Notch receptors and five ligands [jagged 1 (JAG1), JAG2, delta-like 1 (DLL1), DLL3 and DLL4]5. Having this simplicity, the Drosophila model offers the ease to dissect/study the effects of pathway modifiers on Notch-ligand interactions and subsequently on Notch signaling. In certain contexts during animal development (including wing development in Drosophila), both cis- and trans-interactions are involved to achieve proper Notch signaling and cell fate1,6. It is important to distinguish the effects of Notch pathway modifiers in these contexts on cis- versus trans-interactions of Notch with its ligands. Our group previously reported that addition of a carbohydrate residue called xylose to Drosophila Notch negatively regulates Notch signaling in certain contexts, including wing development7. Loss of shams (the enzyme that xylosylates Notch) leads to a "loss of wing vein" phenotype7. More recently, gene dosage experiments and clonal analysis were used to show that loss of shams enhances Delta-mediated Notch singling. To distinguish whether the enhanced Notch signaling in shams mutants is a result of decreased cis-inhibition or increased trans-activation, ectopic overexpression studies of Notch ligands in larval wing imaginal discs using the dpp-GAL4 driver were performed. These experiments provided evidence suggesting that Shams regulates trans-activation of Notch by Delta without affecting Notch cis-inhibition by ligands8. However, feed-back regulations and effects of endogenous ligands might complicate the interpretation of ectopic overexpression studies1,6,9. To resolve this issue, Drosophila S2 cells10 were used, which provide a simple in vitro system for Notch-ligand interaction studies11,12. S2 cells do not express endogenous Notch receptor and Delta ligand11 and express a low level of Serrate13, which does not affect Notch-ligand aggregation experiments8. Therefore, S2 cells can be stably or transiently transfected by Notch and/or individual ligands (Delta or Serrate) to generate cells that exclusively express the Notch receptor or one of its ligands, or a combination of them. Mixing of Notch-expressing S2 cells with ligand-expressing S2 cells results in the formation of heterotypic aggregates mediated by receptor-ligand binding11,12,14. Quantification of the aggregate formation provides a measure of trans-binding between Notch and its ligands15 (Figure 1). Similarly, S2 cells can be co-transfected with Notch and Delta or Serrate ligands (i.e. cis-ligands). Cis-ligands in these Notch-expressing S2 cells abrogate the binding of Notch with trans-ligands and result in decreased aggregate formation8,12,14. The relative decrease in aggregate formation caused by cis-ligands provides a measure of the inhibitory effect of cis-ligands on binding between Notch and trans-ligands (Figure 2). Accordingly, cell aggregation assays were utilized to examine the effect of loss of xylosylation on trans- and cis-interactions between Notch and its ligands. Here, we present a detailed protocol for cell aggregation assays aimed to evaluate the binding of Notch with trans-ligands and its inhibition by cis-ligands using Drosophila S2 cells. As an example, we provide the data that allowed us to determine the effect of Notch xylosylation on binding between Notch and trans-Delta8. These straightforward assays provide a semi-quantitative assessment of Notch-ligand interactions in vitro and help determine the molecular mechanisms underlying the in vivo effects of Notch pathway modifiers. Use wild-type yellow white (y w) genomic DNA and pAc5.1-EGFP as template and the following primer pairs to amplify the DNA fragments used in dsRNA synthesis. Use the following PCR thermal profile: Denaturation (95 °C, 30 s), Annealing (58 °C, 30 s) and Extension (72 °C, 1 min). NOTE: EGFP dsRNA is used as negative control. Gel-purify the polymerase chain reaction (PCR) products using a commercial gel purification kit according to manufacturer's protocol. Perform in vitro transcription using a commercial product capable of transcribing from a T7 promoter according to manufacturer's protocol. Purify the dsRNA using an RNA purification kit according to manufacturer's protocol and store at -80 °C. Assess the efficiency of shams knockdown by using the following steps (1.5.1-1.5.5). Count the cells manually using a hemocytometer and plate 5 x 105 S2 cells in each well of a 6 well plate in 1 mL/well of Schneider's medium supplemented with 10% Fetal Bovine Serum (FBS) and 100 U/mL Penicillin-Streptomycin. Add 7.5 µg of EGFP- or shams dsRNA to each well and incubate at 25 °C for 24 h.
Harvest the control (EGFP dsRNA-treated) and shams dsRNA-treated S2 cells by gentle pipetting followed by pelleting down by centrifugation at 1,000 x g for 5 min at 25 °C and process for RNA isolation using an RNA extraction kit according to manufacturer's protocol. Quantify the RNA using a spectrophotometer and process 100 ng of RNA for 1-step qRT-PCR using commercial qPCR reagents and primer/probes and the following PCR thermal profile: Denaturation (95 °C, 15 s) and Annealing/Extension (60 °C, 1 min). NOTE: Please see the Table of Materials for information on the primer/probe sets and the instrument used for shams and control qRT-PCR experiments in these studies. Calculate relative shams mRNA levels using the 2-ΔΔCT method16. Prepare signal-receiving cells (S2 cells expressing the Notch receptor). Count the cells manually using a hemocytometer and plate 5 x 105 S2 and stable S2-Notch cells in each well of a 6-well plate in 1 mL/well of Schneider's medium supplemented with 10% FBS and 100 U/mL Penicillin-Streptomycin. NOTE: For S2-Notch cells, which are available from Drosophila Genomics Resource Center (DGRC), add 200 nM methotrexate in media. To prepare a 0.5 mM methotrexate stock solution, first prepare a 20 mM methotrexate solution in 250 µL of 1 M NaOH. Next, dilute this solution to 0.5 mM in 1 M phosphate buffer saline and store at -20 °C. In S2-Notch cells, expression of the Notch protein is under the control of the Drosophila metallothionein promoter in the pMT vector. Add 7.5 µg of dsRNA to each well and incubate at 25 °C for 24 h.
Add 0.7 mM CuSO4 to induce the expression of Notch and incubate at 25 °C for 3 days. NOTE: CuSO4 is used to induce expression of proteins controlled by the metallothionein promoter. Prepare signal-sending cells (S2 cell expressing Delta or Serrate ligands). Count the cells manually using a hemocytometer and plate ~5 x 106 stable S2-Delta or S2-SerrateTom cells in each well of a 6-well plate in 1 mL/well of Schneider's medium supplemented with 10% FBS and 100 U/mL Penicillin-Streptomycin. NOTE: Add 200 nM methotrexate for S2-Delta cells and 100 µg/mL hygromycin for S2-SerrateTom cells in media. Expression of Delta and SerrateTom—a Tomato-tagged, functional version of Serrate12—is under Drosophila metallothionein promoter in the pMT vector. 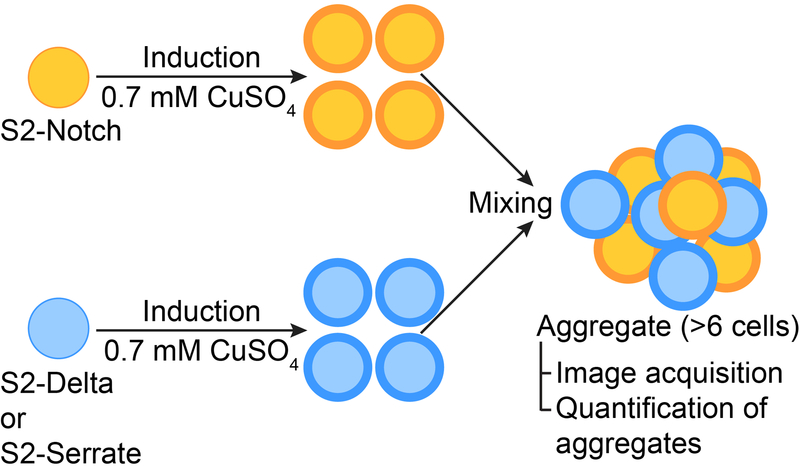 Add 0.7 mM CuSO4 to induce the expression of ligands and incubate at 25 °C for 3 h.
Perform aggregation between signal-sending and signal-receiving cells. Harvest the dsRNA-treated S2 (control) and S2-Notch cells by gentle pipetting and plate 2.5 x 105 cells/well in a 24-well plate after manual counting by hemocytometer. Add 5 x 105 stable S2-Delta or S2-SerrateTom cells in a total volume of 200 µL of Schneider's medium (supplemented with 10% FBS and 100 U/mL Penicillin-Streptomycin). NOTE: All S2 cells handling (including plating, induction and dsRNA treatment) was done under a biosafety cabinet. 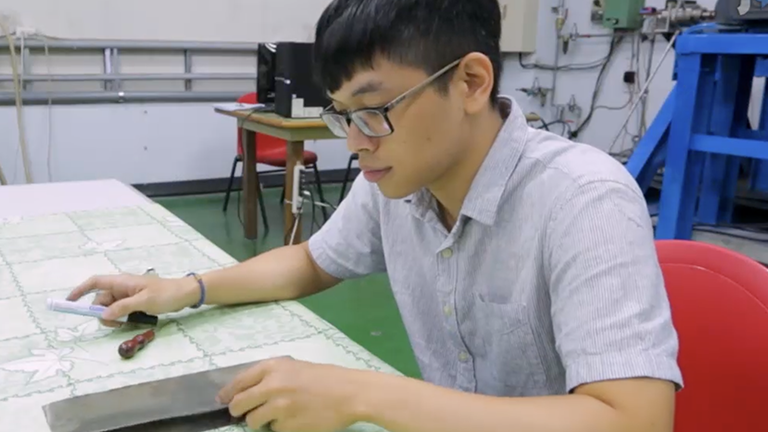 Place the plate on an orbital shaker at 150 rpm (942.48 rad/min). After 1 min, mix the contents of each well and take 20 µL out for counting the number of aggregates. Simultaneously take a representative image under inverted compound microscope using 10x magnification (PLL 10/0.25 objective). Manually count the aggregates (>6 cells) using a hemocytometer. Place the plate on a shaker. Repeat the image acquisition and counting after 5 min and 15 min of aggregation. Calculate the number of aggregates per mL between S2 cells and S2-Delta or S2-SerrateTom cells as a background control. Calculate the number of aggregates per mL between S2-Notch and S2-Delta or S2-SerrateTom cells (magnitude of trans-binding). Plate 5 x 105 S2 cells in each well of a 6-well plate in 1 mL/well of Schneider's medium supplemented with 10% FBS and 100 U/mL Penicillin-Streptomycin. Co-transfect the dsRNA-treated cells with pBluescript and pMT-Notch11 (DGRC) alone or with pMT-Notch and pMT-Delta11 (DGRC) or pMT-Serrate17 for a total DNA concentration of 2 µg/well using a commercial transfection reagent according to manufacturer's protocol. NOTE: pBluescript is used as a control. The co-transfected cells will be called S2-Notch&Deltatransient or S2-Notch&Serratetransient cells hereafter. Incubate the transiently-transfected S2 cells at 25 °C for 24 h.
Add 0.7 mM CuSO4 to induce the expression of Notch and the ligands and incubate at 25 °C for 3 days. Prepare signal-sending cells as described in 2.2. Perform aggregation between signal-sending and signal-receiving cells as described in section 2.3. Quantify inhibition of trans-binding by cis-ligands. Calculate the number of aggregates per mL between S2 cells and S2-Delta or S2-Serrate cells as a background control. Quantify the magnitude of inhibition by cis-ligands as follows. Define A as Number of aggregates between S2-Notchtransient and S2-Delta cells. Define B as Number of aggregates between S2 cells transiently co-transfected with Notch and Delta (S2-Notch&Deltatransient) and S2-Delta cells. Calculate magnitude of inhibition by cis-ligand (Delta or Serrate) as 100 – C.
NOTE: As an example, if relative aggregation is 45%, then cis-ligands are considered to inhibit the trans-binding by 55%. Our in vivo observations suggested that loss of the xylosyltransferase gene shams results in gain of Notch signaling due to increased Delta-mediated trans-activation of Notch without affecting the cis-inhibition of Notch by ligands8. To test this notion, in vitro cell aggregation assays were performed. First, shams expression in S2 cells was knocked down using shams dsRNA. EGFP dsRNA was used as control. Efficiency of knockdown (KD) was examined by real-time PCR and was shown to be greater than 80%8. Then, the binding of Notch receptor with trans-Delta upon shams KD was examined using aggregation assays. 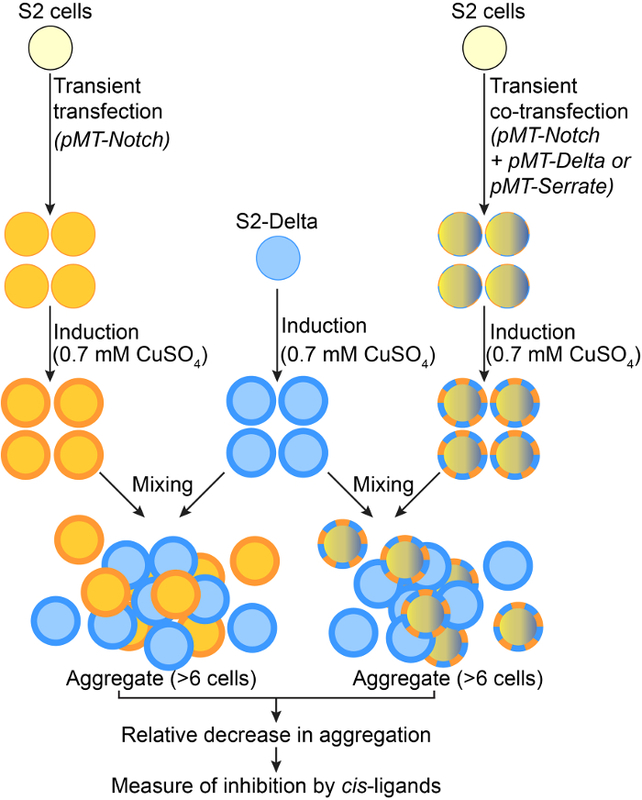 The aggregation between S2-Notch and S2-Delta cells was examined at various time points after mixing them. Aggregation between plain S2 cells and S2-Delta cells was taken as background control. Figure 3 shows the graph indicating the number of aggregates formed at different time points (1, 5, 15 and 30 min) after mixing. A sharp increase was observed in the number of aggregates between 1 and 5 min. Afterwards, the number of aggregates continued to increase until 30 min at a slower rate. Therefore, aggregate formation was imaged at 1, 5 and 15 min and the number of aggregates was quantified after 5 min of mixing. Figure 4A shows representative images of cell aggregation assays between stable S2-Notch and S2-Delta cells to assess the effects of shams KD on the binding between Notch receptor and trans-Delta. Images show the aggregation at three-time points (1, 5 and 15 min). For background control, plain S2 cells (treated with shams dsRNA) were mixed with S2-Delta cells. EGFP dsRNA-treated S2-Notch cells formed aggregates with S2-Delta cells, which increase in number with time. In contrast, shams dsRNA-treated S2-Notch cells formed aggregates faster, and the aggregates were bigger and greater in number than the control ones (Figure 4B). This indicated that decreasing Shams levels enhances the trans-binding of Notch with Delta8. To examine whether Shams regulates the inhibitory effect of cis-ligands on binding between Notch and trans-Delta, we first established that co-expression of Notch and Delta in the signal-receiving cell can decrease the cell aggregation mediated by Notch and trans-Delta. Figure 5A shows the graph indicating the number of aggregates formed between S2-Delta and S2-Notch&Deltatransient cells with different amounts of cis-Delta. Transfecting equal amounts of Notch- and Delta-expression constructs into S2 cells dramatically decreases the number of aggregates formed between these cells and S2-Delta cells. 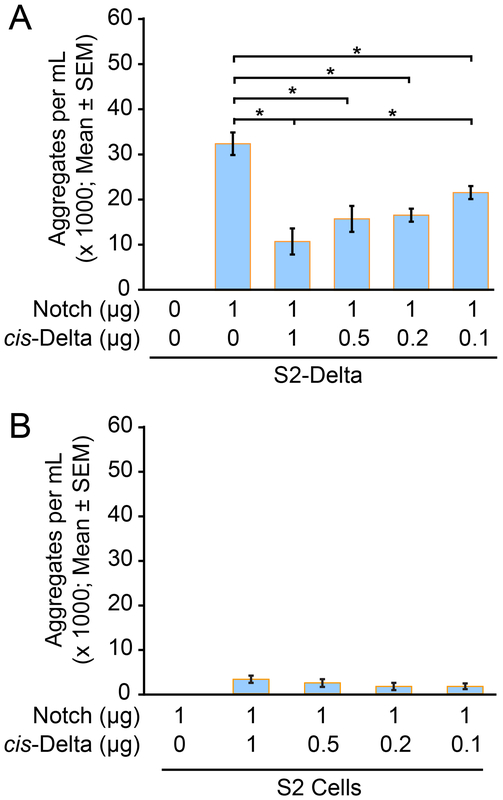 Moreover, decreasing the amount of cis-Delta results in an increase in the number of aggregates, indicating that in the range of Notch/cis-Delta ratios used in these assays, cis-Delta can inhibit the binding between Notch and trans-Delta in a dosage-dependent manner. Since the S2-Notch&Deltatransient cells express both Notch and Delta, they might form homotypic aggregates independently of the S2-Delta cells. To examine if the formation of homotypic aggregates among S2-Notch&Deltatransient cells can be a confounding factor in the cis-inhibition assays shown in Figure 5A, we mixed these cells with S2 cells and quantified the aggregates. Figure 5B shows the number of aggregates formed after mixing S2 cells with S2-Notch&Deltatransient cells expressing various Notch/cis-Delta ratios. A rather small number of homotypic aggregates compared to heterotypic aggregates as shown in Figure 5A was observed. We conclude that these aggregation assays faithfully measure the effect of cis-Delta on binding between Notch and trans-Delta. We next examined the effect of shams KD on the inhibitory ability of cis-Delta. 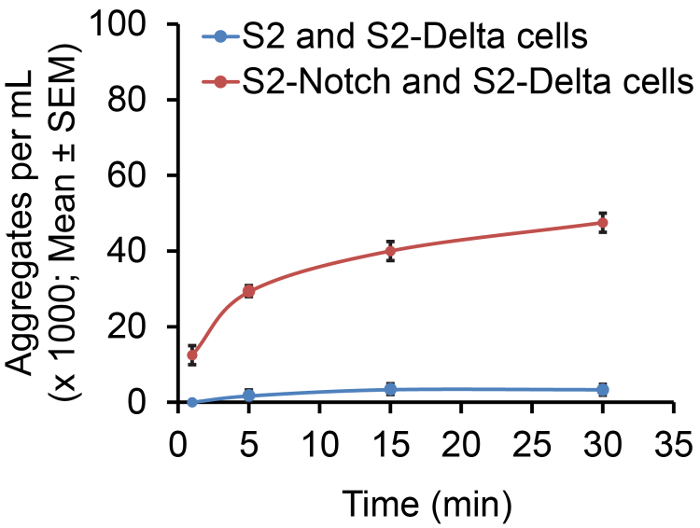 To this end, aggregation between S2-Delta and S2-Notch&Deltatransient cells was examined. Figure 6A shows representative images of aggregation between S2-Delta cells and S2-Notchtransient (control) or S2-Notch&Deltatransient cells. 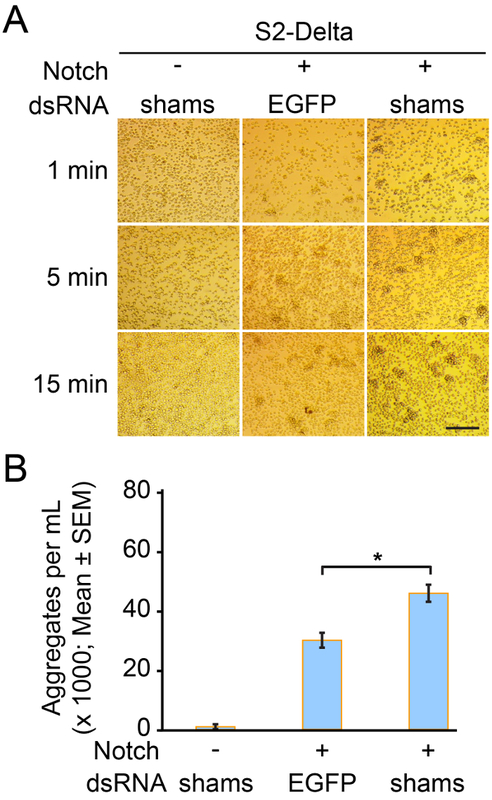 S2-Delta and EGFP dsRNA-treated S2-Notchtransient cells formed aggregates, which increase in number with time, similar to the aggregation between S2-Delta and stable S2-Notch cells (Figure 4). Notably, mixing S2-Delta and S2-Notch&Deltatransient cells co-transfected with equal amounts of Notch- and Delta-expression plasmids formed less aggregates upon both EGFP KD and shams KD, suggesting that decreasing the level of Shams does not affect the ability of cis-Delta to block Notch/trans-Delta binding. To better assess the effects of shams KD on the activity of cis-Delta, the magnitude of inhibition by cis-Delta was measured by calculating the relative aggregation percentage over a range of Notch/cis-Delta ratios as explained in Section 3.4.2. Quantification of relative aggregation showed a comparable inhibition of aggregation upon EGFP and shams dsRNA treatment (Figure 6B). Together, these observations strongly suggest that loss of xylosylation promotes trans-binding without affecting cis-inhibition8, and provide a molecular mechanism for the wing vein loss phenotype observed in shams mutants. Figure 1: Schematic Representation of Cell Aggregation Assay for Trans-binding. Diagram showing induction of receptor (S2-Notch) and ligand (S2-Delta or S2-Serrate) expressing S2 cells by 0.7 mM CuSO4. Induction of both S2 cells is followed by mixing, which tends to make aggregates. These aggregates (>6 cells) are imaged and quantified. Please click here to view a larger version of this figure. Figure 2: Schematic Representation of Cell Aggregation Assay to Assess Cis-inhibition. S2 cells were transiently transfected with pMT-Notch (S2-Ntransient), pMT-Notch and pMT-Delta (S2-Notch&Deltatransient), or pMT-Notch and pMT-Serrate (S2-Notch&Serratetransient). After induction by 0.7 mM CuSO4 and mixing with S2-Delta cells, aggregates (>6 cells) are quantified. Inhibition by cis-ligands is measured in terms of relative aggregation percentage in the presence and absence of each cis-ligand. The effects of cis-ligands on binding between Notch and trans-Serrate can be determined by mixing the transiently-transfected cells with S2-SerrateTom cells (not shown). Please click here to view a larger version of this figure. Figure 3: Aggregation between S2-Notch and S2 or S2-Delta Cells at Different Time Points. Graph shows the number of aggregates per mL at different time points (1, 5, 15 and 30 min) between the indicated types of cells. Error bars indicate standard error of the mean (SEM) of three replicates. Please click here to view a larger version of this figure. Figure 4: Cell Aggregation Mediated by Notch and trans-Delta. (A) Images show aggregation at different time points (1, 5 and 15 min). Aggregation between shams dsRNA-treated plain S2 cells and S2-Delta cells was taken as background control. Shams-dsRNA treated S2-Notch cells show an increase in the number and size of aggregates compared to EGFP dsRNA-treated (control) S2-Notch cells after mixing with S2-Delta cells. Scale bar = 100 µm. (B) Quantification of number of cell aggregates greater than 6 cells after 5 min of aggregation. Error bars indicate SEM. * P <0.01 (One-way Analysis of Variance (ANOVA)). Three replicates with three independent repeats were performed. Please click here to view a larger version of this figure. Figure 5: Cis-Delta Inhibits the Cell Aggregate Formation Mediated by Notch and trans-Delta in a Dosage-dependent Manner. (A) Graph shows the aggregation (in terms of number of aggregates/mL) between S2-Delta cells and S2 cells transiently transfected with different ratios of expression vectors for Notch and cis-Delta (1:0, 1:1, 1:0.5, 1:0.2 and 1:0.1). Error bars indicate SEM. * P <0.01 (One-way ANOVA). Three replicates with three independent repeats were performed. Note that decreasing the level of cis-Delta results in an increase in aggregation, likely due to reduced cis-inhibition. (B) Graph showing homotypic aggregation (in terms of number of aggregates per mL) in S2 cells transiently transfected with different ratios of Notch and Delta (1:0, 1:1, 1:0.5, 1:0.2 and 1:0.1) and mixed with plain S2 cells. Error bars indicate SEM. Number of aggregates is much smaller than the number of heterotypic aggregates formed between S2-Delta and S2-Notch&Deltatransient cells. Please click here to view a larger version of this figure. Figure 6: Knockdown of shams does not Affect the Inhibitory Activity of cis-Delta. (A) Shown are representative images of the effect of shams KD on cis-Delta-mediated inhibition of cell aggregation mediated by Notch/trans-Delta binding. Images show aggregation at different time points (1, 5 and 15 min). Aggregation between shams dsRNA-treated plain S2 cells and S2-Delta cells was taken as background control. Similar to stably transfected S2-Notch cells, shams KD increased the number of aggregates between S2-Delta and S2-Notchtransient cells as compared to control (EGFP dsRNA-treated). 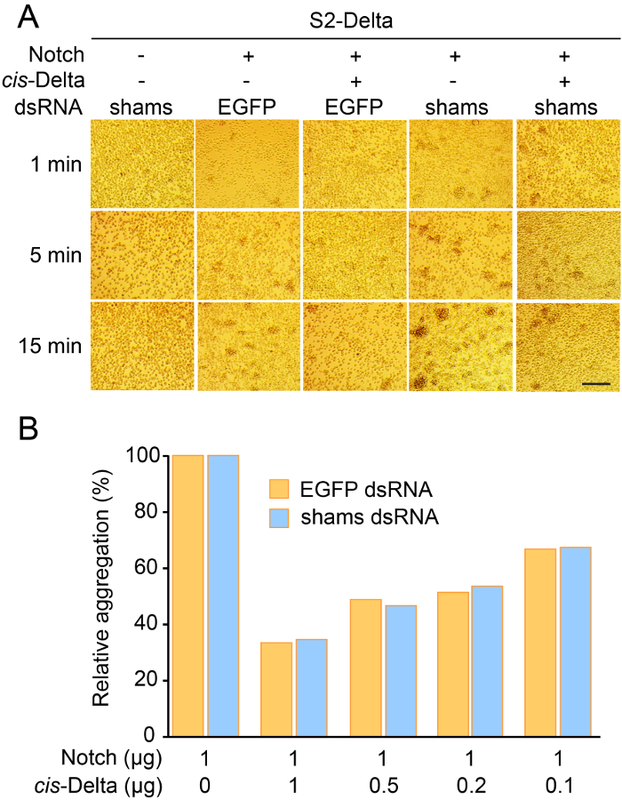 Co-expression of cis-Delta with Notch in a 1:1 ratio resulted in a comparable decrease in the number of aggregates in control (EGFP dsRNA-treated) as well as in shams dsRNA treated cells. Scale bar = 100 µm. (B) Graph shows relative aggregation between S2-Delta cells and S2 cells transiently co-transfected with indicated ratios (1:0, 1:1, 1:0.5, 1:0.2 and 1:0.1) of Notch and cis-Delta. EGFP and shams dsRNA treatment show a comparable decrease in aggregation at each Notch/cis-Delta ratio. Data presented here are representative of three independent experiments. Please click here to view a larger version of this figure. Canonical Notch signaling depends on the interactions between the Notch receptor and its ligands5. Although most studies on the Notch pathway primarily consider the binding of Notch and ligands in neighboring cells (trans), Notch and same-cell ligands do interact, and these so-called cis-interactions can play an inhibitory role in Notch signaling3,4. Accordingly, to decipher the mechanisms underlying the effects of a modifier on canonical notch signaling, it is often pertinent to examine both types of Notch-ligand interactions (trans and cis). However, in many contexts during animal development, involvement of both of these interactions and their feed-back regulation complicates the in vivo studies1,6. In the present protocol, we provide a detailed methodology for in vitro cell aggregation assays using Drosophila S2 cells to evaluate the binding of Notch receptor with trans-ligands and its inhibition by cis-ligands. We have presented the utilization of this methodology to assess the effect of a genetic modifier of Notch signaling (the xylosyltransferase Shams7,8) on receptor-ligand binding. First, aggregation assays were performed between stable S2-Delta and EGFP or shams dsRNA-treated stable S2-Notch cells to examine the effect of shams KD on trans-binding. Aggregation of S2-Delta cells with shams dsRNA-treated plain S2 cells was taken as background control. Shams KD enhanced the aggregation between S2-Notch and S2-Delta cells compared to control. It is important to perform background experimental control aggregations between plain S2 cells and ligand-carrying S2 cells in parallel to the trans-binding experiments. Although Drosophila S2 cells do not express endogenous Notch receptor and Delta ligand11, expression of low levels of Serrate is reported in S2 cells13. Considering this, plain S2 cells were used in cell aggregation assays as background control; these cells did not show any aggregation (Figure 5B). Aggregates are counted manually using a hemocytometer. To ensure consistency in aggregate quantification, 10-20 µL of mixed cell population can be pipetted out from at least three different areas per well for counting. These assays require healthy growing S2 cells. Considering the semi-adherent nature of S2 cells, gentle pipetting while collecting the cells and constant shaking during the aggregation assay are important. Previously, we and others have used well-established, soluble ligand-receptor binding assays for a quantitative assessment of receptor-ligand binding in trans17,18,19,20. Since aggregation assays are semi-quantitative, soluble ligand binding assays were also performed to examine the effect of shams KD on Notch-ligand trans-binding. The observed results were similar in trend with those obtained from aggregation assays8. This attested the faithful evaluation of binding of Notch with trans-ligands using cell aggregation assays. Although the aggregate formation is a readout of receptor-ligand binding, it can be intricate if the surface expression of the Notch receptor or its ligands is affected by the given modifiers. This highlights the limitation of the cell aggregation assays, as it cannot be distinguished if the change in aggregate formation is because of altered receptor-ligand binding or altered surface expression. Therefore, parallel to aggregation assays, the effects of each modifier on surface expression of Notch and ligands needs to be tested in S2 cells. In the context of our studies, surface levels of Notch and Delta were not affected in shams dsRNA-treated S2 cells8. To examine the inhibition of trans-binding by addition of cis-ligands, aggregation assays were performed between S2-Delta cells and EGFP or shams dsRNA-treated S2-Notch&Deltatransient cells. The number of aggregates formed between these cells was compared with the number of aggregates formed between S2-Delta cells and S2-Notchtransient cells. The relative decrease in the number of aggregates was calculated and used as an indicator for the magnitude of inhibition by cis-Delta. The control experiments showed that cis-ligands show a robust and dosage-dependent inhibition of Notch/trans-Delta binding over a rather wide range of Notch to cis-ligand ratios (1:1 to 1:0.1) (Figure 5A)8. A 1:1 ratio resulted in the strongest degree of cis-inhibition, and decreasing the relative level of cis-Delta weakened cis-inhibition. Accordingly, the KD experiments over this range of ratios was performed. Of note, the amount of Notch receptor and the total amount of transfected DNA was kept constant in all experiments. This will ensure that aggregate formation is primarily affected by the activity of cis-ligands and not by altered levels of Notch expression by the cells. It was previously shown that co-expression of Notch and cis-ligands in S2 cells can result in the formation of homotypic aggregations14. To examine whether similar homotypic aggregations among S2-Notch&Deltatransient or S2-Notch&Serratetransient cells can compromise our interpretations of the aggregate quantifications in cis-ligand studies, a control aggregation assay was performed between S2-Notch&Deltatransient and plain S2 cells. The number of S2 cells used in these experiments was the same as S2-Delta cells used in cis-Delta experiments. Some homotypic aggregation was observed, but quantification showed that the resultant aggregates contribute a low fraction of the total aggregates compared with the heterotypic aggregates between S2-Notch&Deltatransient and S2-Delta cells (Figure 5B). We conclude that the changes observed in the number of aggregates in cis-ligand assays are primarily due to the inhibitory effect of cis-ligands on binding between Notch and trans-Delta. In summary, the aggregation assays presented in this protocol provide an easy and straightforward methodology for semi-quantitative assessment of the trans- and cis-interactions of the Notch receptor and its ligands. These assays can be used to examine the effects of genetic or pharmacological Notch pathway modifiers on Notch-ligand binding in vitro and therefore can help elucidate the mechanisms underlying the in vivo effects of these modifiers on Notch signaling. The authors acknowledge support from the NIH/NIGMS (R01GM084135 to HJN) and Mizutani Foundation for Glycoscience (grant #110071 to HJN), and are grateful to Tom V. Lee for discussions and suggestions on the assays, and Spyros Artavanis-Tsakonas, Hugo Bellen, Robert Fleming, Ken Irvine and The Drosophila Genomics Resource Center (DGRC) for plasmids and cell lines. de Celis, J. F., Bray, S., Garcia-Bellido, A. Notch signalling regulates veinlet expression and establishes boundaries between veins and interveins in the Drosophila wing. Development. 124, (10), 1919-1928 (1997). Fortini, M. E. Notch signaling: the core pathway and its posttranslational regulation. Dev Cell. 16, (5), 633-647 (2009). del Alamo, D., Rouault, H., Schweisguth, F. Mechanism and significance of cis-inhibition in Notch signalling. Curr Biol. 21, (1), R40-R47 (2011). Sprinzak, D., et al. Cis-interactions between Notch and Delta generate mutually exclusive signalling states. Nature. 465, (7294), 86-90 (2010). Kopan, R., Ilagan, M. X. The canonical Notch signaling pathway: unfolding the activation mechanism. Cell. 137, (2), 216-233 (2009). Huppert, S. S., Jacobsen, T. L., Muskavitch, M. A. Feedback regulation is central to Delta-Notch signalling required for Drosophila wing vein morphogenesis. Development. 124, (17), 3283-3291 (1997). Lee, T. V., et al. Negative regulation of notch signaling by xylose. PLoS Genet. 9, (6), e1003547 (2013). Lee, T. V., Pandey, A., Jafar-Nejad, H. Xylosylation of the Notch receptor preserves the balance between its activation by trans-Delta and inhibition by cis-ligands in Drosophila. PLoS Genet. 13, (4), e1006723 (2017). Jacobsen, T. L., Brennan, K., Arias, A. M., Muskavitch, M. A. Cis-interactions between Delta and Notch modulate neurogenic signalling in Drosophila. Development. 125, (22), 4531-4540 (1998). Schneider, I. Cell lines derived from late embryonic stages of Drosophila melanogaster. J Embryol Exp Morphol. 27, (2), 353-365 (1972). Fehon, R. G., et al. Molecular interactions between the protein products of the neurogenic loci Notch and Delta, two EGF-homologous genes in Drosophila. Cell. 61, (3), 523-534 (1990). Fleming, R. J., et al. An extracellular region of Serrate is essential for ligand-induced cis-inhibition of Notch signaling. Development. 140, (9), 2039-2049 (2013). Saj, A., et al. A combined ex vivo and in vivo RNAi screen for notch regulators in Drosophila reveals an extensive notch interaction network. Dev Cell. 18, (5), 862-876 (2010). Fiuza, U. M., Klein, T., Martinez Arias, A., Hayward, P. Mechanisms of ligand-mediated inhibition in Notch signaling activity in Drosophila. Dev Dyn. 239, (3), 798-805 (2010). Ahimou, F., Mok, L. P., Bardot, B., Wesley, C. The adhesion force of Notch with Delta and the rate of Notch signaling. J Cell Biol. 167, (6), 1217-1229 (2004). Okajima, T., Xu, A., Irvine, K. D. Modulation of notch-ligand binding by protein O-fucosyltransferase 1 and fringe. J Biol Chem. 278, (43), 42340-42345 (2003). Acar, M., et al. Rumi is a CAP10 domain glycosyltransferase that modifies Notch and is required for Notch signaling. Cell. 132, (2), 247-258 (2008). Bruckner, K., Perez, L., Clausen, H., Cohen, S. Glycosyltransferase activity of Fringe modulates Notch-Delta interactions. Nature. 406, (6794), 411-415 (2000). Yamamoto, S., et al. A mutation in EGF repeat-8 of Notch discriminates between Serrate/Jagged and Delta family ligands. Science. 338, (6111), 1229-1232 (2012).